Laxapana Hydro Power complex is the heart of the hydro power generation in Sri Lanka, strated in early fiftees as proposed by the late engineer Mr. D.J.Wimalasurendra who is known as the father of hydro electricity in Sri Lanka.Still Laxapana Hydro Complex contributes to the development of Sri Lankan Economy by providing electricity at a competitive rate while helping to a sustainable development. Approximately, 98 percent of households are provided with electricity and the government is determined to raise this to 100 percent. Further, the country provides grid electricity to about 80 percent of households, while around 3 percent of households use off-grid systems. At the moment, about 40 percent of electrical energy is used in households, 40 percent in manufacturing industry and the rest in the commercial sector. Since the commissioning of the first hydroelectric power plant in 1950 at Laxapana, hydropower has played a major role in power generation in Sri Lanka. In fact, the largest share of electricity generation came from major hydro development projects until the mid-1990s. 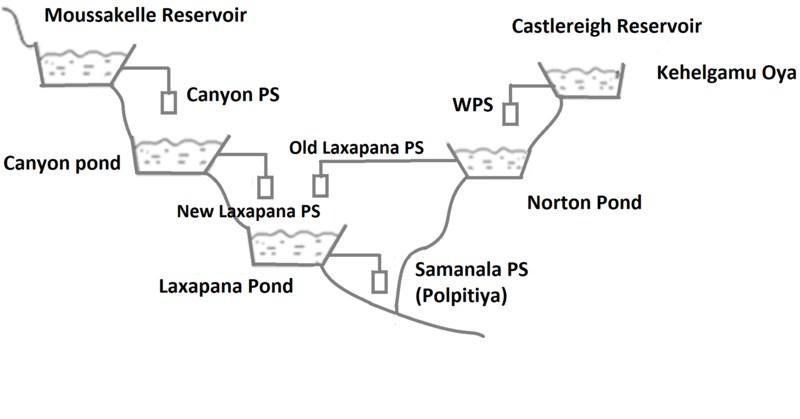 CASCADED RESERVOIR SYSTEM - The Maskeliya Oya is a major upstream tributary of the Kelani River. The tributary measures approximately 40 km (25 mi) in length, originating from the hills of the Peak Wilderness Sanctuary, before passing through the Maskeliya Reservoir. Maskeliya Oya converges with the Kehelgamu Oya at Kalugala, forming the 100 km (62 mi) long Kelani River. The river is heavily used for hydroelectricpower generation. The main large reservoir at the top of Kehelgamu oya is Castlereagh reservoir, where the rain water from the catchment area above the reservoir gets collected. Main reservoir associated with Maskeli oya is Maussakelle reservoir. 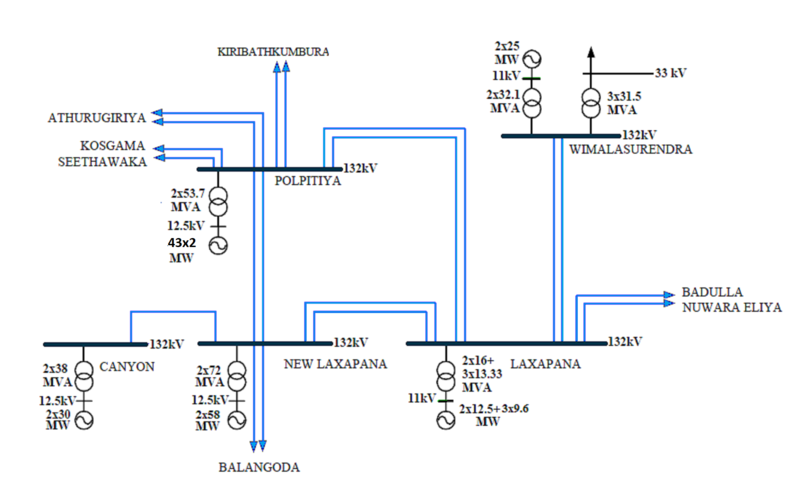 TRANSMISSION SYSTEM - Electric power generation, annually around 1290 GWh is transmitted through 132 Kv transmission system to many parts of the country while interconnecting all our power plants (Canyon, Wimalasurendra, Old Laxapana, New Laxapana and Samanala). ORGANIZATION STRUCTURE - Laxapana complex consists of around 425 employees including engineers, technical officers and technicians of streams in electrical, mechanical, civil who maintain the reservoirs,dams, power houses and associated accessories of the system. Accounting section, HR section and security sections are headed by a accountant, Human resource office and a senior security officer, directly responsible to the Deputy General Manager (Laxapana Complex).